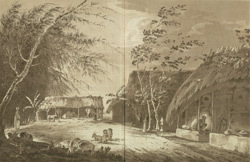 This is plate 16 from William Hodges' book 'Select Views in India'. When Hodges was in India in the 1780s, Bengal was a flourishing kingdom. Calcutta and Murshidabad were its major cities and British life was focused around these two urban centres. The countryside, however, remained the backbone of Bengali life and customs. Hodges wrote that this plate "is intended to show the manners of the common people as the others are for their cultivated arts and their historical events".